Intel's Larrabee: power efficient performance graphics? The steady trickle of Intel Larrabee data continues. This week, Intel revealed that the new multi-core media processing chip will be much more power efficient than existing graphics processors. Intel also said Larrabee benefits from “vector-processing” extensions designed to improve graphics processing. 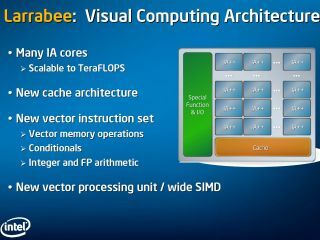 Larrabee is a new many-cores co-processor composed of an array of x86 cores. The first Larrabee chips are expected to pack 16 cores, each broadly compatible with Intel's current PC processors. However, Larrabee's “in-order” cores are significantly smaller and less complex than the heavyweight “out-of-order” found in CPU's like the Core 2 Duo. It's a chip optimised for highly parallel workloads, most notably graphics. Speaking yesterday, Intel vice president and Director Stephen Smith said existing graphics chips from the likes of Nvidia and AMD were much too power hungry. Peak consumption figures of 150 watts or more are not unheard of for high performance GPUs. Smith said the superior efficiency of the Larrabee architecture would allow Intel to create entire performance PC platforms that consumed less than 140 watts. That's an extremely welcome development given the relentlessly ballooning power profile of the modern high performance PC. But we still don't know how well Larrabee will actually perform or even if Intel expects it to be fully competitive in today's raster-based graphics market. Smith merely said he expected Larrabee to “do well” in the fight with AMD and Nvidia. However, Smith did disclose that Intel has added a new vector instruction set to the Larrabee core. Vector instructions are typically used to improve graphics and media processing. Although Smith declined to be drawn on the details, it's like the new instructions are designed to boost Larrabee's rasterisation performance. Rasterisation is currently the dominant form of real-time 3D graphics rendering on the PC. Of course, Larrabee's key advantage over existing GPUs remains its full compatibility with the x86 instruction set as seen in PC processors for several decades. It's a feature Intel reckons will make Larrabee much easier to program for general purpose use than highly specialised GPUs from Nvidia and AMD. The first Larrabee-based add-in boards are expected to be available in late 2009 or early 2010. Meanwhile… Intel also fired off a few new details on its Sandy Bridge processor architecture, due in 2010. It too will receive a new tranche of vector-processing instructions. Known as AVX, the new instructions were described by Intel big wig Pat Gelsinger as “SSE on steroids”. By expanding vector width support from 128-bit to 256-bit, AVX will no doubt deliver another hefty boost in multi-media performance.